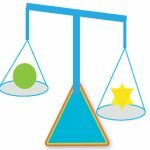 The scales logic puzzle combines elements of maths and logic. You must take a look at the scales and read carefully the information provided. There then follow a range of questions that require you to make logical deductions from the information given of a mathematical nature in order to successfully solve the questions. From relatively simple to rather complicated questions, these add an excellent visual element to any puzzle book or publication of puzzles. They are also ideal for children who are learning maths and logic and therefore would also make a great addition to any children's puzzle book.